Reference: 1) RTE Act-2009 of Ministry of Law and Justice, Govt. of India, dt.27.08.2009; 2) NCTE Gazette Notification, dt.23.8.2010; 3) NCTE, Guidelines for conduct of TET communicated vide Lr.No.76- 4/2010/Acad,dt.11.2.2011. ; 4) NCTE Gazette Notification, dt.29.7.2011. ; 5) G.O.Ms.No.51, SE (Genl.) Dept., dt.16.4.2011. ; 6) G.O.Ms.No.70, SE (Genl.) Dept., dt.06.6.2011. ; 7) G.O.Ms.No.102, Education (SE.Genl.II) Dept., dt.28.7.2011. ; 8) G.O.Ms.No.256, Finance(SMPC-I) Dept., dt.8.12.2011. ; 9) G.O.Ms.No.4, Edn. (Ser.II) Dept., dt.09.01.2012. ; 10) From the Director of School Education, Telangana, Hyderabad Lr.Rc.No.22/TSTET/2015, dt.03-12-2015 & 15.12.2015; 11) From the Director, SCERT & Convenor TET, Telangana Lr.Rc.No.22/TSTET/2015, dated:08.12.2015. It would send a positive signal to all the stakeholders that the Government lays special emphasis on Teacher quality. 2. In the reference 10th read above, the Director of School Education, Telangana, Hyderabad has submitted proposals and Guidelines for conducting Telangana State - Teacher Eligibility Test (TS-TET). 3. Government after careful examination of the proposals of the Director of School Education, Telangana, Hyderabad hereby issue the following Guidelines/ Instructions for conduct of Teacher Eligibility Test (TET) in supersession of the guidelines issued earlier in this regard. 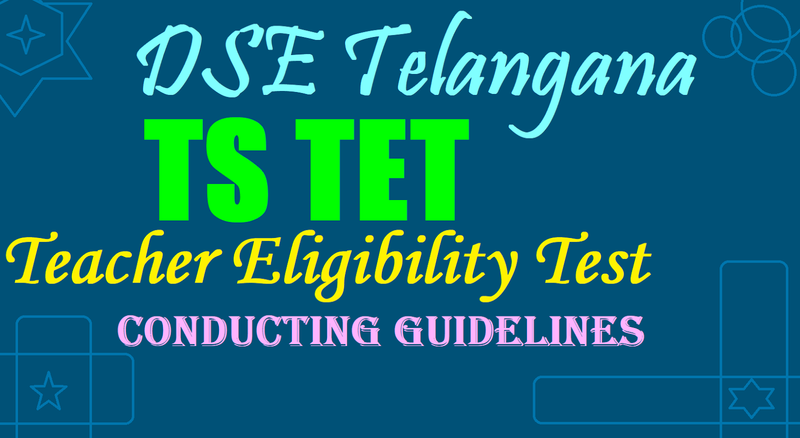 The candidates at the time of applying for TS-TET should be in possession of the following minimum qualifications prescribed for category of 1st to 5th classes (Paper- I) and 6th to 8th classes (Paper - II) separately. (ii) Intermediate / Senior Secondary (or its equivalent) with at least 45% marks. In respect of SC/ ST/ BC/ Differently Abled candidates, the minimum marks shall be 40%. AND pass in 2 - year Diploma in Elementary Education / 4-year Bachelor of Elementary Education (B.El.Ed.) / 2 - year Diploma in Education (Special Education) in case of the candidates, who have passed or admitted to D.El.Ed / D.Ed., course prior to issue of these guidelines. (iv) Graduation with Language concerned as one of the Optional Subjects (OR) Bachelor of Oriental Language (or its equivalent) (OR) Graduation in Literature (OR) Post Graduation in Language concerned AND Language Pandit Training Certificate/ B.Ed with Language concerned as one of the Methodologies, in respect of Language Teachers. Note:- 1. The candidates who are appearing in the final year of Bachelor of Education (OR) Diploma in Elementary Education etc., are also eligible to appear for TET exam subject to the condition that the candidates cannot appear for DSC with this TET certificate, unless the candidates acquire requisite qualification. 3. Intermediate qualification of Board of Intermediate Education (BIE) of Telangana State or its equivalent as recognized by BIE, Telangana State only shall be considered. So also the Bachelor’s Degree of a University Recognized by UGC only shall be considered. The Committee is empowered to take decisions on the Schedule for conduct of TET with calendar of activities, logistics for conduct of TET, issue of Notification, issues that arise on conduct of TET and is responsible for the overall supervision of the conduct of TET. A TET Cell shall be created with the following staff to man and conduct the TS- TET in accordance with the decisions taken by the TET Committee. 1) Director SCERT - Nodal Officer & Ex-Officio Director TET. A separate account shall be opened for the purpose of TET Funds and the Accounts shall be audited every year by a Chartered Accountant. The Director, SCERT – Nodal Officer & Ex-Officio Director, TET is authorized to conduct TET in an effective manner assisted by field functionaries viz. RJDSEs, DEOs, etc. He/ She shall take up pre and post examination activities scrupulously as per the Guidelines and Schedule for every TET decided by the TET Committee. He/ She shall formulate a detailed procedure and lay down instructions for conducting TET. The DEO shall be the Officer responsible to conduct TET in the Districts under the overall supervision of the District Collectors. The maintenance of records like examination material, non-examination material shall be up to 6 months from the date of TET, except where legal cases are involved. TET shall be conducted once in a year preferably in the month of April/ May. There shall be no restriction on the number of attempts a person can take for acquiring the TET Certificate. A person who has qualified in the TET Examination may also appear again for improving his/her score. (a) Any Central Government/ State Government/ Local Body/ Private recognized High School/ Jr. College/ Degree College/ P.G. College/ College of Education/ D.Ed College/ Engineering College/ Polytechnic/ ITI can be identified by DEO with the approval of District Collector for constituting an Exam Centre for TET. (b) Each Centre with good accommodation and furniture shall have a capacity of Optimum 240, Maximum 300 for allotment of candidates. (c) The Centres in the District will be identified in District Head Quarters, Municipalities and Revenue Division Headquarters only. (d) If an Institution has good accommodation and furniture, Multiple Centres up to a limit of four (4) Centres in that Institution can be constituted, and designated as ‘A’ Centre, ‘B’ Centre, ‘C’ Centre and ‘D’ Centre of the same address with separate Centre Nos. and separate exclusive facilities. The structure and content of the TET is given in the following paragraphs. All questions will be Multiple Choice Questions (MCQs), each carrying One Mark, with Four alternatives out of which One Answer will be correct. There will be no Negative Marking. There will be Two Papers of the TET, Paper-I will be for a person who intends to be a teacher for Classes 1st to 5th Paper-II will be for a person who intends to be a teacher for Classes 6th to 8th. A person who intends to be a Teacher either for Classes 1st to 5th or for Classes 6th to 8th shall have to appear in both Papers (Paper I and Paper II) (if eligible). Note(1): The test items on Child Development & Pedagogy will focus on Educational Psychology of teaching and learning relevant to the primary level. Note(2): How to choose language – I of TS-TET Paper-I: The following languages are offered under First Language in the Schools under the State Syllabus viz., Telugu, Urdu, Hindi, Bengali, Kannada, Marathi, Tamil and Gujarathi. A Candidate has to choose one of these 8 Languages under Language-I of TET, those candidates should have compulsorily studied that Language either as medium of study or as First Language at least up to Class X. The candidates who studied CBSE/ ICSE curriculum can choose the Language which they studied up to Class X. Note(3): The Language-II shall be English for all the candidates. Note(4): The syllabi for Mathematics & Environmental Studies are designed on the basis of topics of Classes I to V. The difficulty standard as well as linkages of content/topics could be up to Secondary Stage (up to Class X) for testing. The test items in Mathematics and Environmental Studies will contain Multiple Choice Questions (MCQs) not only on Content but also on Pedagogy. In Mathematics, 24 MCQs will be on Content and 6 MCQs on Pedagogy. Similarly, in Environmental Studies 24 MCQs will be on Content and 6 MCQs on Pedagogy. Note(5): The syllabi for Language I & II shall be based on Proficiency in the Language, Elements of Language, Communication and Comprehension abilities (standard up to Class Xth level). Note(6): In 30 MCQs under Language I & II, each shall include 6 questions on Pedagogy of a Language. Note(7): The detailed syllabus for all subjects shall be designed by the SCERT and the same shall be issued along with Notification. Note:(1) The test items on Child Development & Pedagogy will focus on Educational Psychology of teaching and learning relevant to the Elementary level. Note:(2) How to choose Language - I of TS-TET Paper-II: The following Languages are offered under First Language in Secondary schools under the State Syllabus viz., Telugu, Urdu, Hindi, Kannada, Marathi, Tamil and Sanskrit. A Candidate (other than Language Pandit candidate) has to choose one of these 7 Languages under Language I of TET, those candidates should have compulsorily studied that Language either as medium of study or First Language at least up to Class-X. The candidates who studied CBSE/ ICSE curriculum can choose the Language which they studied up to Class X. Language Pandit candidates have to choose the Language of their study in Pandit Training concerned under Language-I of TET Paper-II. c) Science Pedagogy – 06 MCQs. Note(5):For Paper II Social Studies, the syllabus will cover the sectors namely, History, Geography, Civics and Economics. Out of 60 marks, 48 will be on Content and the remaining 12 on Pedagogy. Note(6): For Paper II, the syllabi for TET of Mathematics, Sciences & Social Studies are based on topics of Classes VI to VIII. The difficulty standard of questions as well as their linkages could be up to Senior Secondary Level (12th class). Note(7): The syllabi for Language I & II shall be based on proficiency in the Language, Elements of Language, Communication and Comprehension abilities (standard up to Senior Secondary Level (12th Class). (b) The Director, SCERT, Telangana shall issue Memos/ Pass Certificates to the candidates. (c) The validity of Certificates shall be for a period of 7 years from the date of TET concerned. (d) The Certificate shall contain the Name and Address of the Candidate, Registration No., Year/ Month of Award of Certificate, Marks obtained in each Paper, Class level of its validity (Class 1st to 5th , Class 6th to 8th or Both) and in case of Classes 6th to 8th, the Subject Area (Mathematics, Science and Social studies) etc., The Certificate may be Electronically generated with adequate security features to avoid any kind of malpractice. (e) Differently Abled candidates with at least 40% of handicap only shall be considered in respect of Visually and Orthopedically Handicapped. With regard to Hearing Impaired candidates, a minimum of 75% handicap shall be considered. The TS-TET shall apply to all the Schools referred to in Clause(n) of Section 2 of the RTE Act. However, a School referred to in Sub-Clause(iv) of Clause(n) of Section 2 of the RTE Act, may exercise the option of considering either the TET conducted by the Central Government or the TS-TET. The weightage to TET scores shall be provided in the Teacher Recruitment of the State Government. i.e., 20% weightage for TET and 80% weightage for Written Test in Teacher Recruitment Test (TRT) based on which selection lists shall be prepared. However, mere qualifying the TET would not confer a right on any person for recruitment/ employment as it is only one of the eligibility criteria for appointment. 13. The Govt. shall have powers to make Rules, issue Clarifications and Guidelines which may arise in regard to the implementation of these Guidelines. All legal disputes with regard to the conduct of TET shall be subject to the Jurisdiction of the Courts located in the State of Telangana only. Sir I had completed Bsc B.ed method 1 maths method 2 Telugu . (MA Telugu completed) So can I write Tet paper 2 social studies..
can ctet paper 2 qualified candidates appear for dsc? APTET Qualified Telangana Students are eligible to write TS DSC 2016 ..
Sir i did B.com,M.B.A but working now as a teacher with private school.So,to get settle with this job profile first of all what is my eligibility and what are all exams I can attempt? Please read the above article carefully for your doubts..
sir ap state students TS DSC ki eligibility unda..and ap student's TS TET rayala vodha..!? so can i eligible for D.sc English? Last year tet 2016.paper 2 I was attended.my degree percentage is 43%.may i attend the next Tet exam or not. ?